The Hexayurt is a simplified disaster relief shelter design. It is based on a geodesic geometry adapted to construction from standard 4×8 foot (1200 x 2400) sheets of factory made construction material. It resembles a panel yurt, hence the name. The basic model is 166 square feet (15.4 m2) in size and uses 12-18 sheets of foil-covered polyisocyanurate insulation, or hexacomb cardboard. Buildings are held together with half-foot-wide foil-surfaced duct tape and anchored to the ground like tents. A plastic tarp provides a floor. This building’s design is in the Buckminster Fuller lineage of using contiguous triangles to maximize the load-bearing ability of simple structures. The basic construction principle is to use full sheets for the walls. Sheets cut from one corner to the opposite corner provide right triangles. Each pair of right triangles can be assembled into an isosceles triangle that is 8 feet wide and 8 feet in height, thus forming a roof panel. Tape is used to make simple hinges on doors and windows. Window covers are hinged at the top to form window shades. 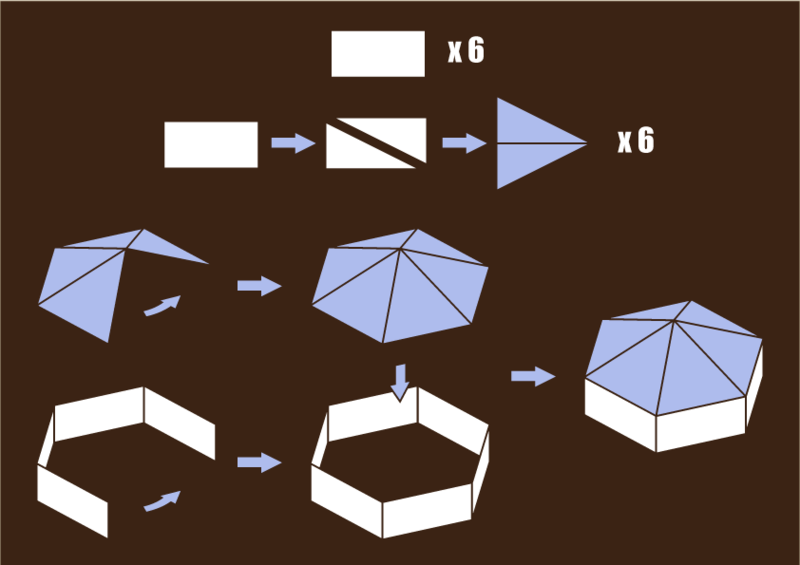 How the shapes fit together to make the Hexayurt. Hexayurts can be fabricated from four-by-eight foot sheets of ply, foam or hexacomb cardboard and duct tape. The cost has been estimated at $1,000 each (compared to $30,000 for a FEMA trailer). Plans are being developed to equip them with high-efficiency wood stoves, composting toilets and fluorescent lights. The instructions are available on Appropedia and are released as public domain by the inventor Vinay Gupta. 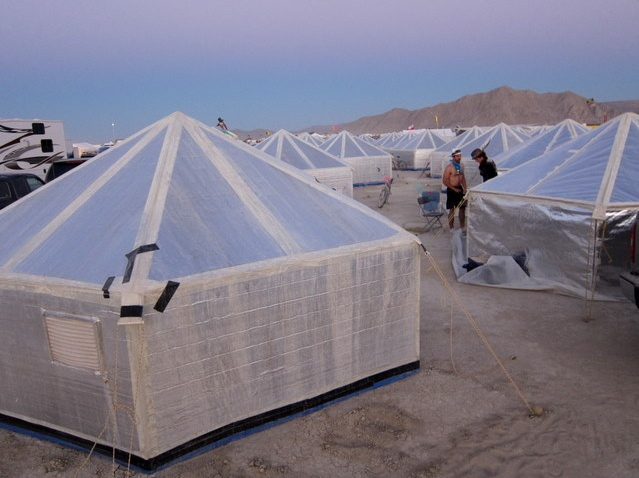 The hexayurt project has been running since 2003. It was featured in Design Like You Give a Damn (Metropolis, 2006), a book on shelters produced by Architecture for Humanity. In August 2007 the project won the Participate award, which is run by Treehugger, and Burning Man festival. DISASTR Hotel was designed for Australian conditions and built from painted and wallpapered 9mm CD Ply.